Capture the attention of your audience immediately with the brilliant high-definition images with up to 1920x1020 resolution. Simply turn on the RICOH D6500 Interactive Whiteboard for Business to get started, without calibrations or IT support. When you want to reach even more people, connect to a Ricoh video conferencing system or to a Ricoh projector to present in large conference rooms and auditoriums. Use your finger or the felt-tipped electronic pen to add text, draw shapes and highlight key information directly on screen. Or take advantage of the optional Pen Sensor Kit for even more precision when working with your most detailed spreadsheets, schematics and blueprints. Opportunities are limitless when the right people have the right information. 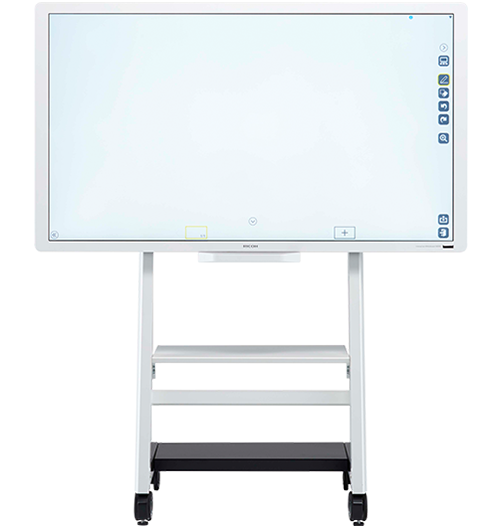 Whether you're on a wired or wireless network, you can connect up to 20 Ricoh interactive whiteboards to show the same presentation simultaneously in multiple remote or onsite locations. Another 20 participants can login via PIN to each of those smart whiteboards to view the presentation from their PC, smartphone, tablet or other device. Remote users can download a Ricoh iPad® app and interact in real-time by drawing, editing or highlighting information directly on the presentation. You've customized your presentation to make it more accurate and insightful. Why stop now? Keep collaborating after the meeting by turning the electronic whiteboard presentation into a PDF and sharing it with your audience. Every time you add text it's saved as searchable PDF text, so you and other users can use keywords to track revisions and specific annotations. Choose what happens to your presentation after you share it. You can simply shut off the electronic whiteboard and erase everything automatically to keep the next group from accessing confidential details. Or you can store it in a network directory or USB drive directly from the smart board for later use. If those aren't available, you can store it temporarily on the interactive whiteboard's solid-state drive until you find a better, more permanent and more secure location.